With three years of iPhone ownership I’ve become accustomed to the design and behaviour of iOS, yet at the same time ignorant of other smartphone platforms. As an interactive designer working on mobile products this can lead to poor assumptions and little empathy for users of different platforms. As a responsible consumer, it’s important to understand the wider marketplace so my choice of phone is based upon an informed decision. Thankfully, with Clearleft having acquired a few different devices for mobile testing, I can spend a little time with each to learn how they work. First up; Windows Phone 7. I’ve watched the development of this platform from afar and been impressed by what I’ve seen. At this year’s SXSW I saw a presentation by Mike Kruzeniski where he made the case for print-inspired content-led interfaces — an approach that contrasts sharply with Apple’s latest skeuomorphic designs. The print tradition from which the Metro language is derived is clear from the outset; many screens could be enlarged and hung up on the wall as posters, such is their typographic beauty. Microsoft should be applauded for innovating in an area where others seem happy to replicate the Apple aesthetic. 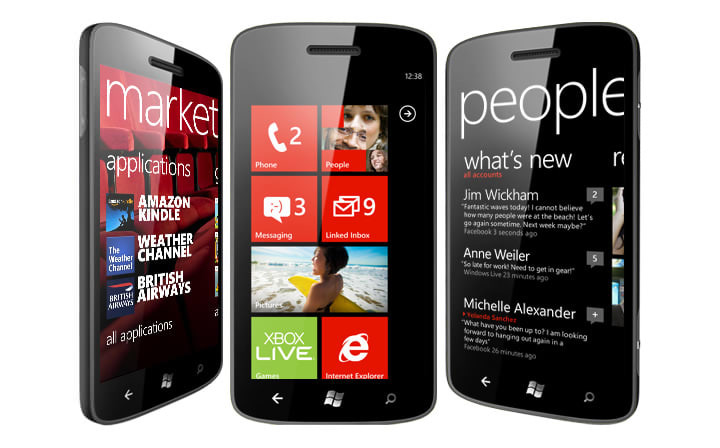 Windows Phone 7 is innovative beyond the underlying design language. A home screen which displays tiles containing snippets of relevant information (number of new emails, next appointment, missed calls etc.) makes the notification badges on iOS look positively simplistic. The latest ‘Mango’ release adds some nice features too. The Twitter integration makes up for the lacklustre Windows Live service (which appears to be Microsoft’s failed attempt at a social network) and the Maps application adds ‘Local Scout’; local information with restaurants, shops and nearby sights powered by Bing. The battery saver feature is something I’d love to see on the iPhone. Though there is little similarity with iOS, it is interesting to see those areas where Apple’s leadership has defined standard features. Marketplace is clearly inspired by the App Store, and a number of multi-touch gestures found on iOS can be found in WP7 also. Windows Phone 7 has been thought about deeply. Such is the quality that I found it hard to decide whether UI idiosyncrasies were the result of bad design, or purely down to my familiarity with iOS. Much like Android, Microsoft requires device manufacturers to include three hardware buttons below the screen: Back, Home and Search. The Home button worked as expected, but the other two felt like mystery meat. At first I thought the search button would initiate application specific searches, but in most cases a second button was provided instead (leading to odd scenarios where two search buttons appeared in close proximity). The back button allows you to traverse a history of the different screens you viewed, regardless of application; behaviour that took some getting used to based on my prior usage of iOS. Microsoft’s application guidelines appear strictly enforced, meaning most third-party applications use standard interface patterns regardless of their suitability. I’m sure developers will start to push the boundaries in time, but the current Orwellian conformance results in a strange blandness. I felt underwhelmed. Customisation is limited, with users able to pick from a light or dark theme and a single accent colour. It was hard to work out when this colour was used for stylistic reasons, and when it was used to give affordance to a link. Whilst the stark minimalism is beautiful, it’s also problematic. The interface felt cold and emotionless, with information stripped away to the point of frustration. The typographic approach made using applications feel like hard work, with everything demanding to be read. Where icons were used, their meaning was difficult to discern. I found myself tapping around aimlessly, wondering what action would result, or trying to remember what gestures I used to achieve something. The status bar is a fine example. It seems reasonable to hide the icons typically found in this area, but when I wanted to glance at the battery life or network connectivity this information wasn’t available without fumbling around. It was never clear how you could get it to appear. In conclusion, I’m puzzled by Windows Phone 7. This is a Microsoft product that takes a very un-Microsoft approach, with design at the centre of the product. As such it’s visually stunning, yet still feels unfriendly and — in some places — difficult to use. Still, this is a platform with plenty of potential. Whether the market will hold out to see it realised is up for discussion. Finally, a note on the hardware, in this case the HTC HD7. Whilst this wasn’t the focus of my test drive, it was interesting to compare with the iPhone. The 480 × 800, 4.3" screen had a comparable resolution to an iPhone’s retina screen, but the slow refresh rate became all too apparent upon scrolling text. Much has been made of larger screens versus the 3.5-inch size adopted by Apple. I hadn’t paid much attention to the screen size, but I couldn’t shift an underlying feeling of difficulty using the device. It was only on reading Dustin Curtis’ post, that I realised why. The hardware buttons at the bottom of the device demanded constant usage, yet these were always out of reach, meaning I had to constantly reposition my hands. The specifications would suggest the 5MP camera would produce images comparable with a compact. However image quality was not only worse than my current iPhone 3G, but even worse than some of the feature phones I owned five years ago. Incorrect colours and high compression rendered many of the photos I’d taken useless. The power, volume and camera buttons felt soft, and by being recessed into the side were hard to locate and difficult to press. A fold-out stand on the back of the device was a nice feature, but introduced a weak point meaning this could easily snap off with heavy usage. Overall, a good looking device that on closer inspection revealed itself to be cheap and fragile.